A rarity in Europe: Water served automatically. Usually it must be ordered and it costs as much as any other beverage. We stumbled into a delicious find while visiting Appenzell, a village in the Alpstein limestone range, near Mount Santis in Switzerland’s Northeast corner. We arrived off the tram from Kronberg hungry, as we always are after an invigorating ride over the rails, so finding a restaurant was foremost in our minds. There are different ways to find restaurants, and we have developed our own methodology. We check our favorite travel guide-book – Rick Steves’ Switzerland, then wander the cobblestone streets in a confused manner as though we don’t have a guidebook at all, all while staring at the guidebook’s map, then at the buildings. Lokal takes its gelato seriously. Mmmmmm .... gelato. As though foreordained, a shop catches my eye and Dave, trying to hold to our original gastronomic purposes, waits outside to study the map/guidebook while I peruse the store shelves where I always find everything is much too expensive. It is true, I am cheap, but when I find a pair of shoes that sell for $267 while I am wearing the same make for which I paid $110, I am none too impressed. Shopkeepers perceive this and pretend to speak no English. Either that or they are insulted by my harmless questions about their retail ethics. By the time I exit the store (or stores), our hunger reaches the fussy level, our pace increases, my interest in shopping diminishes and our path takes on a pinball trajectory, that is to say, we hurry from one Rick Steves-recommended restaurant to another, finding some minor flaw with each one that sends us on our way again. We go through about a half-dozen restaurants in this manner, judging them by the shallowest, yet truest of means: The customers at the outside cafe look sick of each other’s company and there is no food in front of them, suggesting a long wait and tardy service; a funny smell comes out of the kitchen; the posted menu is only in German, stoking our fear that we will accidentally dine on horse or rabbit meat; the place is empty; the low lighting through amber glass windows prohibits suitable scrutiny of the food and the list goes on. 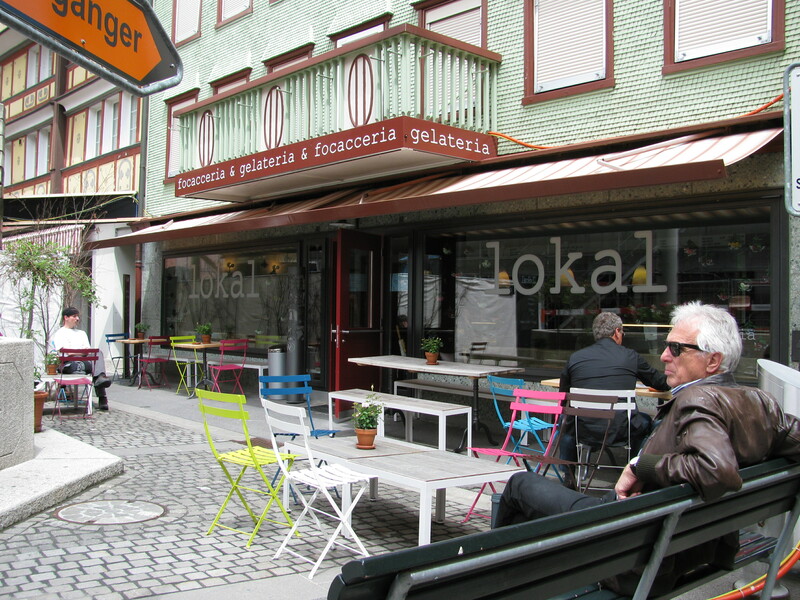 We look for places populated by locals on the grounds that they are the best judges of a restaurant’s fare, so it may be that a bistro we came across named “Lokal” twigged a subliminal familiarity, predisposing us to looking favorably on it, and then we found a mention of it in our guidebook, where Rick Steves labels Lokal’s offerings as the opposite of Swiss fare. That seemed like an endorsement to us fearers of horse meat, so in we went. At this point, we were starving and a little glassy eyed, which the server may have recognized because she spent a lot of time explaining the menu to us, which was very kind, however, it prolonged the ordering process and we weakened even further. Eventually, I ordered a crepe filled with banana gelato, which shows just how vulnerable we had become. Dave using the classical pointing method to order his lunch. He has no idea what he is pointing at. Dave pointed out sandwich fillers from the display case in such a random manner that by the time we sat down he could only identify his sandwich contents by their colours – “red things,” “green stringy things.” If there was horse meat in it, we would not have known because we are unfamiliar with the colour of cooked horse meat (when raw it has a burgundy tone not often seen in beef). So we sat down and accepted our fate, only to find that it was all good. Lokal happens to specialize in its focaccia bread, and it was superlative, soft and not too chewy as is too often the case with North American focaccias. The preserved tomatoes and peppers were lightly seasoned and bit back just enough to tease the tongue. The crepe was perfect, although I did feel weird having a frozen dessert wrapped inside a hot crepe. Maybe this exists elsewhere but I don’t think I’ve ever ordered it. This is the beauty of being a fussy eater – I’m easily impressed and look on old staples as crazy new concoctions. 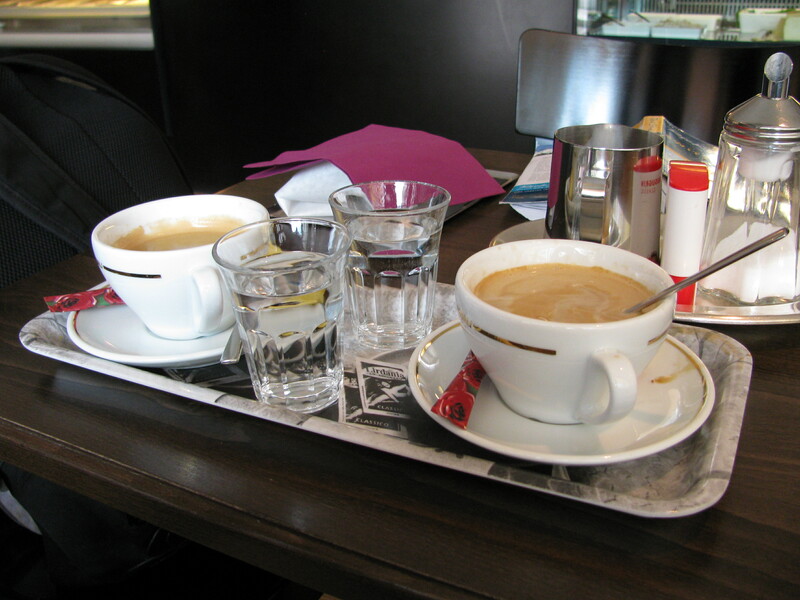 We took on the attitude of Europeans who when they take a table are practically leasing it. We ate everything, then jumped up and ordered some more, lounged, ate more, enjoyed the relaxed atmosphere along with other loafing diners as though we were hanging around in our mothers’ kitchens. The two women servers – who may have been proprietors, they looked that engaged in their work – were pleasant and helpful, unobtrusive, but ready to deliver more goodies at the slightest sign of hunger pangs. The gelato is made in-house of local dairy and “Alpstein” water, which pours down from the limestone Santi Mountain – and is without any artificial dyes. I sampled the chocolate, walnut and banana. The chocolate was fabulous, but I am a chocolate addict so am rarely disappointed. The banana gelato was strikingly intense; the walnut gelato was unique, subtle, and very very good. In all, Lokal offered about 16-20 varieties and if I lived there, I would have tried them all. Check out the restaurant’s (German only) website here or enter Lokal Appenzell into Google and click on “translate this page.” I give this understated eatery the thumbs up. Sandwich: 8 out of 10. Gelato: 10 out of 10 (yes, a 10!). Crepe – undecided. It wasn’t really filling as a lunch item, but it was delicious. Price: $37 for a continuous stream of food for two, very reasonable for Switzerland.